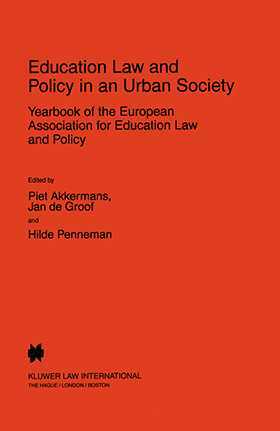 Just how fascinating the discussion between the disciplines of education law and education policy can be was apparent at the 'Annual Congress' of the European Education Law and Policy Association (ELA) in Rotterdam in December 1997. Although, on this occasion, the option was for an education policy subject, a multi-disciplinary approach is always to be preferred. Policy-makers interrogate lawyers; lawyers question scientists from other fields of study and lines of practice. It was, at the same time, a further illustration of how inspiring and productive--in the context of the European Union at any rate--comparative analyses can be for national and international education and social policy. The theme of the 1997 Congress, and consequently of this Yearbook , was urban education policy and its legal form as the touchstone of the modern interpretation of individual and social rights. This collection of thought-provoking essays and country reports thus centres on the question: what challenges for education do urban associations represent?